The Rough-legged Hawk is among the least understood raptors in North America, largely because its breeding range is mostly above the treeline in the arctic, and even the winter distribution is quite northerly. MRF is interested in tracking wintering Rough-legged Hawks in southern Quebec and Ontario to learn more about their movements, and in particular fidelity to wintering grounds. A full species profile for the Rough-legged Hawk will be posted here once research commences. 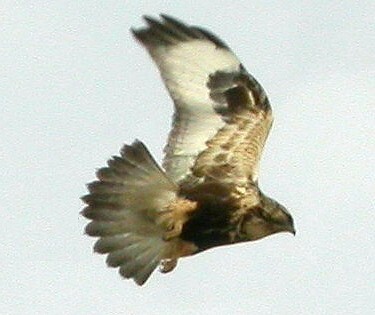 Rough-legged Hawk in southern Ontario.